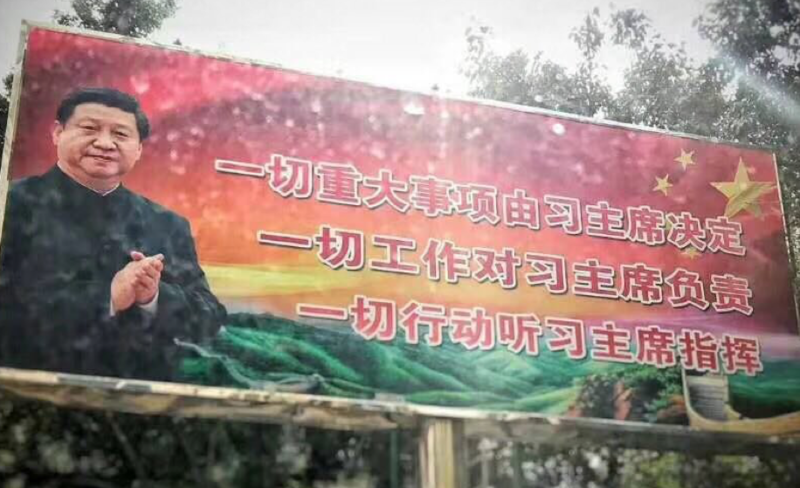 In recent days, the above image of a roadside propaganda billboard in China proclaiming that “all” work, actions and major business must follow Chinese President Xi Jinping has made the rounds on the internet. All major matters are decided by Chairman Xi Jinping; all work must be responsible to Chairman Xi Jinping; all actions must heed the direction of Chairman Xi Jinping. The phrase, and its shortened slogan, first appeared after the 6th Plenum of the 18th CCP Central Committee in 2016, the same session that brought the formal designation of Xi Jinping as “the core” of the Chinese Communist Party — a clear sign at the time of his growing power and position. 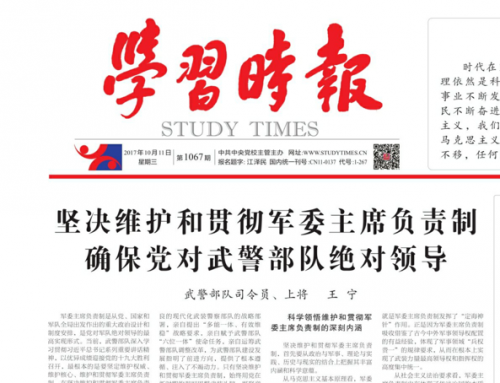 On November 28, 2016, shortly after the plenum, the phrase appeared in a commentary printed in the People’s Liberation Army Daily, the official mouthpiece of the Party’s Central Military Commission, called, “Comprehensively Raising the Study and Implementation of the Spirit of Xi Jinping’s Series of Important Speeches” (把学习贯彻习主席系列重要讲话精神全面提高到新水平). On February 7, 2017, the Political Work Department of China’s Central Military Commission(中央军委政治工作部) issued a document called, “Resolutely Protecting the Core, Remaining Firm in Heeding the Commands of the Party (坚定维护核心 坚决听党指挥), which again used the phrase. 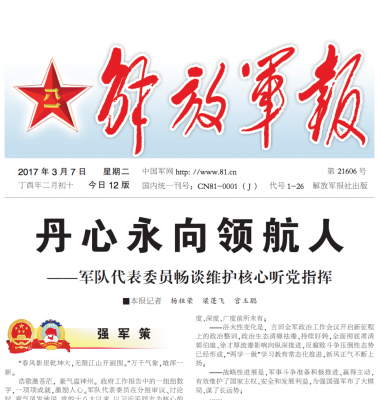 Below is the front page of the People’s Liberation Army Daily one month later, on March 7, 2017, in the midst of that year’s National People’s Congress. [We must] ensure that all major matters are decided by Chairman Xi Jinping, that all work is responsible to Chairman Xi Jinping, and that all actions heed the direction of Chairman Xi Jinping . . . . [We must] resolutely respond to Chairman Xi promotes, resolutely carry out what Chairman Xi decides, and resolutely avoid what Chairman Xi prohibits. The “Three Resolves,” on the other hand, is not unlike another line from the Cultural Revolution: “What Chairman Mao adores I adore, what Chairman Mao supports I support, when Chairman Mao directs I comply, when Chairman Mao gives the signal I advance” (毛主席热爱我热爱，毛主席支持我支持，毛主席指示我照办，毛主席挥手我前进). You can see below a propaganda poster from the time showing this four-part formula. 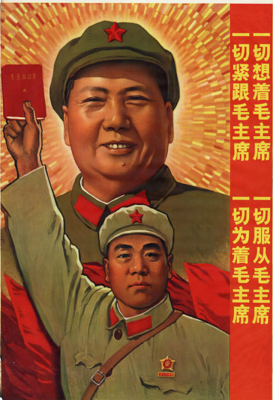 During the Cultural Revolution, a number of slogans that emerged from within the military rapidly spread throughout society, catching like wildfire across the country. But the dispersion patter of the “Three Alls” and the “Three Resolves” has been different. In this case, the People’s Liberation Army has loudly proclaimed both, and the rest of the media and society have answered by giving them the cold shoulder. 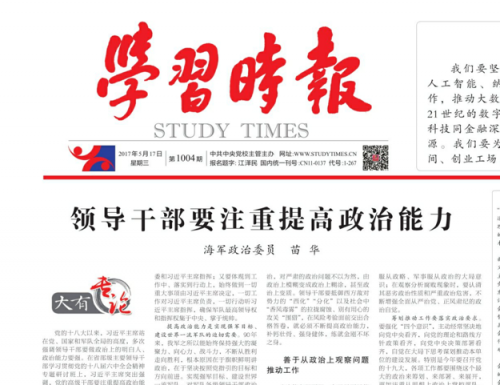 A number of regional newspapers included the “Three Alls” on August 31, 2018, as they published a Xinhua News Agency article bearing the voluminous title, “Building the Army With Politics, Ever Onward with Roots Firm: A Record of Promoting A Strong Military With the Leadership of the Central Committee With Comrade Xi Jinping as the Core” (政治建军，固本开新永向前——以习近平同志为核心的党中央领导和推进强军兴军纪实). But this was a rare instance, and the term has thus far appeared just three times in the pages of the People’s Daily. The “Three Resolves,” on the other hand, have yet to appear in the Party’s flagship newspaper. 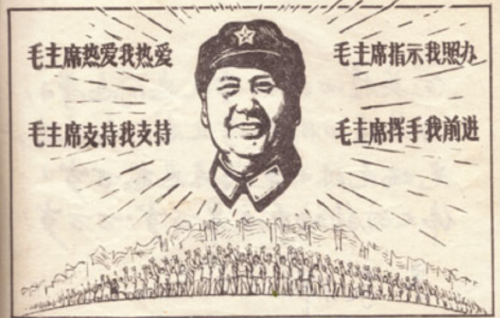 For its part, the People’s Liberation Army Daily has been the most enthusiastic in its promotion of both the “Three Alls” and the “Three Resolutes.” What is more difficult to understand, however, is why the whole stretch of enthusiasm for these phrases lasted just 16 months, beginning on November 28, 2016, and continuing through to March 18, 2018. [We] must strengthen the “Four Consciousnesses,” increase the “Four Confidences,” ensure that all. Major matters are decided by Chairman Xi, that all work is responsible to Chairman Xi, that all actions heed the direction of Chairman Xi, [We must] resolutely respond to Chairman Xi promotes, resolutely carry out what Chairman Xi decides, and resolutely avoid what Chairman Xi prohibits. And yet, after this we find the “Three Alls” and the “Three Resolutes” disappearing altogether from the Party press. 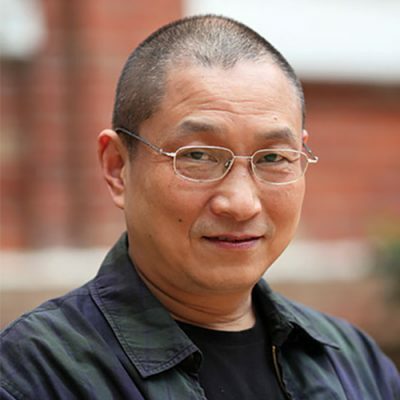 In my “China Discourse Report 2018,” I dealt recently, as I always do, with the rise and fall, ebb and flow, of various key phrases in the political discourse of the CCP. Here again are two phrases we have seen rise and then summarily disappear.